Absolutely fantastic service from Julie today. Boosted my daughter's confidence immensely knowing that there are a number of options available to help with her hair loss. No pressure to buy but we will definitely be visiting again soon to sort a hair piece. Thank you so much. I have been going to Julie at Trendco for the last 12 months having lost my hair due to chemotherapy. Julie spent a long time with me trying to find the right wig and she did so very successfully. I have had two wigs and on my last visit she clearly told me that I did not need another one and styled my new growing hair to enable me to walk out without a wig! How great a person is that. I cannot recommend Julie highly enough. Had my first real hair wig today and Julie made me feel normal again like being at the hairdressers having my own hair cut !! Have lost hair as a result of medication following a renal transplant. Decided to take the plunge and explore possible wigs. Julie was fantastic and I was so taken with my new look that I walked out of the shop wearing it and have received nothing but compliments since. Thank you Julie and the team, I know I will be seeing you very soon for more ideas. I have been suffering from unexplained hair loss for a couple of years and had got to the point where my specialist suggested a wig. It took me three months to summon the courage to go to Trendco and I am SO glad I did. Marie was kind, understanding and incredibly patient, showing me many styles and making very useful suggestions. There was absolutely no pressure to buy and in fact, I did not on this visit, wanting time to think over various options. I also tried some of the scarves and turbans. Wow! I've been wearing various scarves and small hats and not been happy with them. Trendco's aren't cheap but they are beautifully designed and made and the difference they make is amazing. I went home with a bag full! Special mention to the receptionist, Lorraine, who is equally kind and understanding. Purchased 2 enhancers having alapecia, very pleased.. Julie was amazing! Styled them went through every step of the way , extremely helpful , thankyou Julie you are second to none! 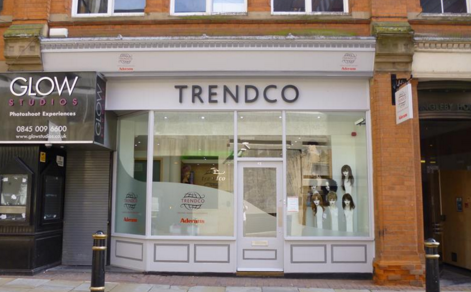 I have been visiting trendco at birmingham for many years.to start with it was very hard for me dealing with the problem.julie has always been really understanding and patient with me .i think i can say i have tried almost everything there from ready to wear to made specificaly for me. I am now comfortable with the ready to wear ones.over the years i have got to know julie naomi and lorraine they all tell me honest opinions and are really helpful. I'm a 24 year old whom has different from thinning hair due to polycystic ovaries on and off for a number of years. I recently had a baby and with the hair loss after giving birth I lost most confidence more and more as my hair fell out in handfuls when I touched it. I went to trending and immediately felt welcome and confident they could help me. Julie was lovely and helped me realise that in my panic a wig wasn't what I needed but a clip in hair pice would hide the thinning. I love my new hair pice my hair feels and appears so much thicker and looks a perfect match for my hair colour. So pleased! The staff are very nice & helpful. On arriving at the shop finding it very hard to accept I was going to be losing my hair & needed to pick a wig , Naomi was so lovely & made it a lo easier to deal with. My 9 year old daughter was very upset at seeing me trying wigs on & again Naomi was brilliant with her & got her involved. I am 16 years old and have Trichotillomania for me the thought of buying a wig caused me a lot of anxiety, I was worried that people would judge my condition and that I would find it difficult finding a style which suited me. The people at Trendco completely understood and in no way patronized me and were so kind and helpful. They made it clear they dealt with people like me who were in the same position, had the same anxieties and they could not have reassured me better. As someone who suffers with social anxiety it was really helpful for me that they have a private consultation room away from other customers. The wig I ended up with is really beautiful, amazing quality and I feel really happy and confident in it. My 16 year old daughter has trichotillomania and has been fitted and come away with a wig which makes her look and feel a million dollars, she looks fantastic and everyone was very helpful - it was all about my daughter and making it work for her, smoothing out any issues and ensuring anxiety was kept to a minimum. Brilliant service - thank you all. It has been a long journey over the past 3 years since developing alopecia and both Julie and Naomi have been wonderful. They have given me impartial advice on different hairpieces and there have been many! But more importantly they made me feel at complete ease even through the tears which eventually turned into laughter. Thank you all for your understanding and support which I know will continue for many years.